It seems that learning cursive writing is slowly becoming a thing of the past, often replaced today by typing. However I believe that learning to read and write cursive is still a very valuable skill! Our oldest daughter who is 13 has struggled with print style handwriting for most of her life. She has many of the symptoms of dysgraphia and it makes hand writing difficult for her although it’s getting better. So I was really happy to have the opportunity to review the CursiveLogic Workbook from CursiveLogic. 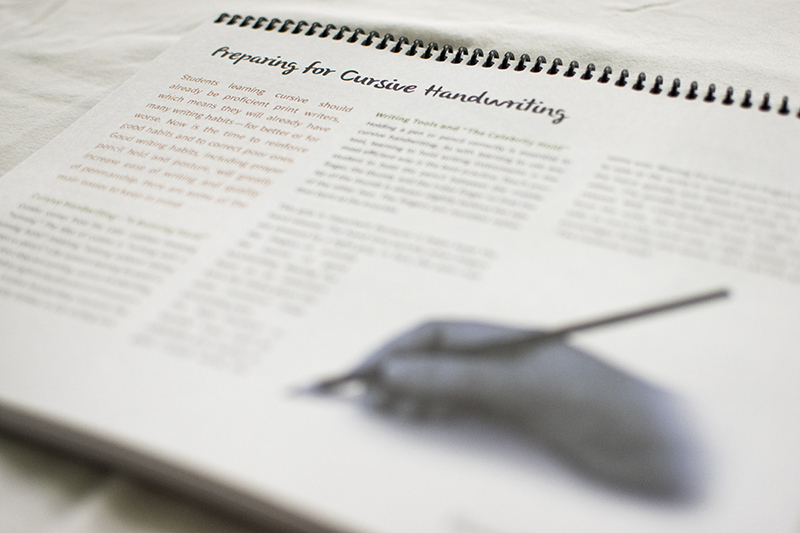 CursiveLogic workbook is a soft cover, spiral bound workbook that contains everything you need for a cursive writing course. CursiveLogic teaches writing different from any other writing program I have used before! To start with students learn cursive writing by grouping lower case letters by shape. There are only four shapes for all of the lower case alphabet. Each CursiveLogic lesson focuses on one shape group and the shape groups are thought in a special order. I also loved that instead of teaching each letter as one individual letter, CursiveLogic teaches by letter strings. From the very first lesson students are learning how to properly connect letters together. They use common shapes, colour coding and verbal cues to help students remember the letter shapes. Since CursiveLogic starts teaching writing in groups of letters by the end of the first lesson students can write REAL words! I have to say that I’ve really enjoyed using CursiveLogic with my daughter. We’ve been working through the program slowly because of her hand writing challenges but this is the first cursive writing program that really is helping her! Because she is a strong right brain learner the methods of shape grouping, colour coding and verbal queues are helping her to really get the hang of cursive writing. She’s also finding it much easier then printing. CursiveLogic is intended to be used with children age 7 and older who already know how to print. It is specially geared to the older child who would like to learn how to write in cursive quickly and begging writing with real words.